The Love Armor project began as a means to show concern for both our military and the civilian populace in the war zones of Iraq and Afghanistan. A statement of purpose and an invitation to participate in this huge collaborative project was sent out to knitters and artists in 2007. Our challenge was to transform a war icon into a symbol of peace and hope. The Love Armor represents the work of over 70 participants nationwide. As of September 2, 2008, the Humvee cozy (15� x 7�x 6�), our central image, was completed. It premiered on a Humvee M1026, delivered by the New Mexico National Guard. On September 6th, our Love Armor reception, in the 6,000 square foot Munoz/Waxman gallery at the Center for Contemporary Arts, set a record for the largest attendance at a CCA (Santa Fe) opening. Viewers admired the Humvee cozy, participated in an area provided for interaction, watched documentary videos, and felt connected with a unique musical composition and performance created by Molly Sturges, who just received a prestigious United States Artist Fellowship. On September 11th, in a Community Ceremony, the Humvee was brought home by the National Guard; and the cozy was transferred, with reverence and care, to an armature �where it floated as a symbol of peace and hope. We see this as the beginning of a journey for the Love Armor project to be shown in venues around the country. Please note: an article regarding the Love Armor project will be published in the Fiber Arts magazine, Spring, 2009 issue. Although the LAP is timely in many ways, it is also "timeless" in its broad message � bringing people together with a humanist voice. Our aim is to continue to promote interest in bringing this project to galleries, museums, alternative spaces, and educational environments. Because of the timeless aspect, we hope to be considered for exhibitions in the future (as we know many venues plan years in advance). We would like to meet with any interested directors and curators to discuss some ideas for educational outreach and interactive programs, along with the visual presentation. One of our goals is to raise awareness of the importance of community service, especially for young people. 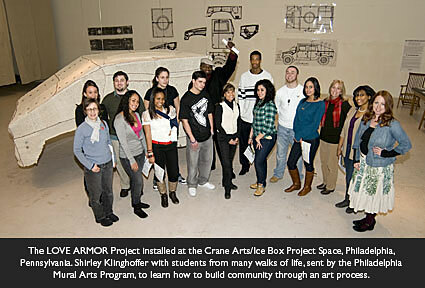 The Love Armor project provides a great catalyst for dialogue.